Central sensitivity syndromes are characterized by distressing symptoms, such as pain and fatigue, in the absence of clinically obvious pathology. The scientific underpinnings of these disorders are not currently known. Modern neuroimaging techniques promise new insights into mechanisms mediating these postulated syndromes. 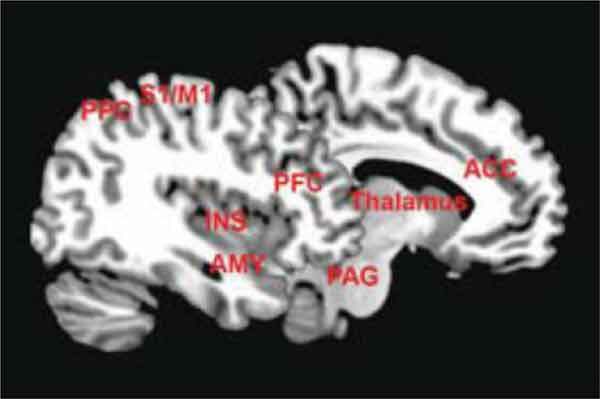 We review the results of neuroimaging applied to five central sensitivity syndromes: fibromyalgia, chronic fatigue syndrome, irritable bowel syndrome, temporomandibular joint disorder, and vulvodynia syndrome. Neuroimaging studies of basal metabolism, anatomic constitution, molecular constituents, evoked neural activity, and treatment effect are compared across all of these syndromes. Evoked sensory paradigms reveal sensory augmentation to both painful and nonpainful stimulation. This is a transformative observation for these syndromes, which were historically considered to be completely of hysterical or feigned in origin. However, whether sensory augmentation represents the cause of these syndromes, a predisposing factor, an endophenotype, or an epiphenomenon cannot be discerned from the current literature. Further, the result from cross-sectional neuroimaging studies of basal activity, anatomy, and molecular constituency are extremely heterogeneous within and between the syndromes. A defining neuroimaging “signature” cannot be discerned for any of the particular syndromes or for an over-arching central sensitization mechanism common to all of the syndromes. Several issues confound initial attempts to meaningfully measure treatment effects in these syndromes. At this time, the existence of “central sensitivity syndromes” is based more soundly on clinical and epidemiological evidence. A coherent picture of a “central sensitization” mechanism that bridges across all of these syndromes does not emerge from the existing scientific evidence. Central sensitization, neuroimaging, fibromyalgia, fatigue, irritable bowel, temporomandibular joint disorder, vulvodynia. National Center for Complementary and Integrative Health, National Institutes of Health, 10 Center Drive, Bethesda, MD 20814, USA.